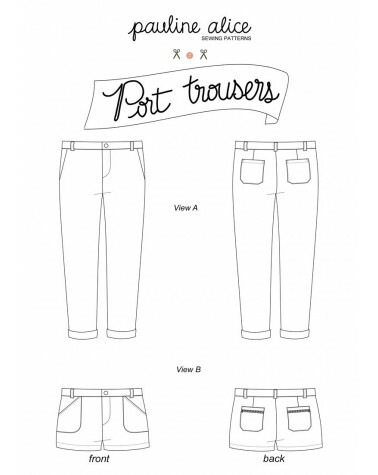 The Port trousers have a relaxed fit through hip and thigh with a tapered leg. They feature a front zipper fly, a mid-rise and belt loops. View A: ankle length trousers with front slant pockets and back patch pockets. View B: shorts version with front patch pockets and back zipped pockets. -Lining for View A: lightweight fabric such as cotton batiste. -All views: thread, a 15 cm (6”) metallic zipper, a 2,5 cm (3/4”) button for the fly. -View B: two 15 cm (6”) metallic zippers. Publish your projects here. View photo gallery here.